Neuroimmunol Neuroinflammation 2017;4:65-8.10.20517/2347-8659.2017.11© 2017 OAE Publishing Inc.
1Perrett Laver, SW1P 3AE London, UK. 2Department of Neurology, Cornell University, New York, NY 10065, USA. 3Department of Neurology, University of Chicago, Chicago, IL 60611, USA. 4Department of Neurology, Northwestern University, Chicago, IL 60611, USA. Aim: A need for Neurologists exists in the USA. The majority of Neurology residency graduates go on to additional subspecialty training. Methods: Data from the Accreditation Council for Graduate Medical Education from 2001-2014 and the United Council for Neurologic Subspecialties from was analyzed for trends in the number of Neurology subspecialty training programs and their composition. Results: There has been an overall trend of growth in the number of accredited Neurology subspecialty training programs and fellows. These trends vary between specific subspecialties. Conclusion: The authors provide an overview of the contemporary state of Neurology subspecialty training in the USA. A clearer understanding of subspecialty training allows for anticipation of workforce surpluses and deficits. Over 2,200 graduating medical students matched in Neurology Residencies in 2014. If current trends persist, the majority will seek additional subspecialty training and certification. [4-6] The establishment and existence of these numerous subspecialties may not only be reflective of, but may also help drive the subspecialization of neurologists. There is interest in providing earlier subspecialty exposure to grow the number of trainees pursuing training in specific subspecialties. There are also ongoing efforts to augment residents abilities and interest in pursuing careers in academic medicine, many of which include subspecialty training in neurology fellowships. All of this is occurring within the context of changes in the healthcare environment and their subsequent effect on neurology resident education. Our study attempts to provide a comprehensive descriptive overview of the current state as well as a clear and easily understandable picture of the trends in Neurology graduate education training. An understanding of the current and future workforce in Neurology will be essential for the estimation of future geographic and specialty skill surpluses and deficits in the workforce. This understanding will be of value in the decision making regarding how to best address those deficits. Data was collected from the 2001-2002 to 2013-2014 editions of the ACGME Data Resource Book. Accredited United States and international programs must verify their statistics and update them yearly. UCNS specialties and subspecialties data were obtained from their website. We analyzed these yearly reports focusing on the changes taking place not only in the number of programs and residents, but also individual breakdowns by gender, specialty, and program. In alignment with the increasing number of physicians pursuing careers in neurology, the number of programs for neurology subspecialty fellowship training has shown a steady increase over the course of the past thirteen years. The increase in the number of specific subspecialty fellowship programs is mirrored by an increase in fellows enrolling in training programs in those subspecialties. The number of overall fellows per program has remained fairly steady. This is indicative of subspecialty training programs remaining a relatively stable size. The largest increases each year in total number of training programs is found in Child Neurology, Neuromuscular Medicine, and Vascular Neurology. Child Neurology has shown a 175% increase during the 13-year period of the study with an average increase of 13.46% each year. Neuromuscular Medicine, having only been accredited for 9 years, has also shown rapid growth, increasing 600% over the 9 years of its accreditation, averaging a 66.67% increase each year. Vascular Neurology, having been accredited for 11 years, has grown 860%, averaging 78.18% more fellows each year. Interestingly, while all 3 subspecialties have shown dramatic increases in fellows, the changes in their respective number of programs have differing trends. Child Neurology has increased its programs by only 10.6% in 13 years, with Clinical Neurophysiology increasing at 443% in 9 years, and Vascular Neurology. This most likely represents a maturation of the subspecialty and the slowed growth rate one would expect with this. The existence of gender differences amongst Neurology subspecialty trainees can be noted. Neurodevelopmental Disabilities (89%) and to a lesser degree Child Neurology (65%) demonstrate a disproportionate number of female trainees while Endovascular Surgical Neuroradiology (0%) and Vascular Neurology (26%) have a disproportionate number of male trainees. While in some subspecialties the proportion of female trainees remains relatively stable, Neurodevelopmental Disabilities (89%), Child Neurology (65%), and Clinical Neurophysiology (51%) all have a growing percentage of female trainees. 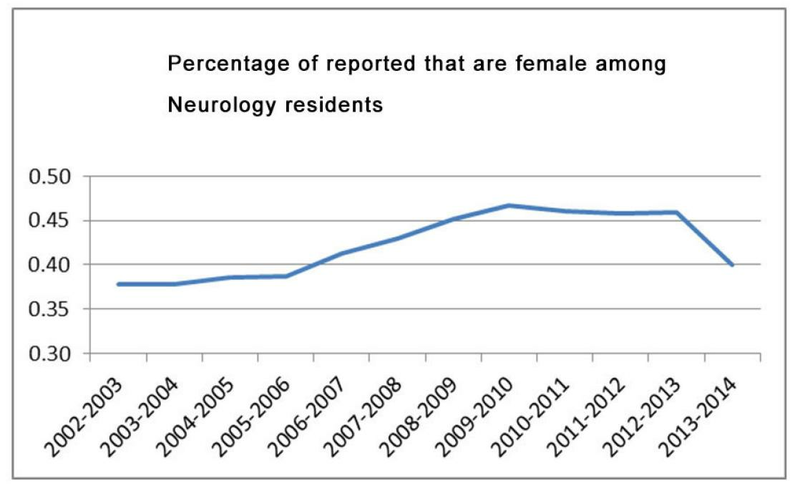 It is unclear what exact effect the initial growth in the proportion of female Neurology residents peaking in 2009-2010 at ~47%, and the subsequent decline will have on subspecialty career choices [Figure 1]. The number of physicians in the United States becomes larger and more diverse with each new class of graduating medical students. This influx of new physicians benefits the medical community with the supplementation of new physicians to an aging society and growing healthcare needs. Additionally these trainees will replace physicians lost to attrition via retirement or death. With over 120 specializations for new medical graduates to choose from, medical trainees have a broad range of potential career choices. With a predicted growth in the shortage of clinical neurologists, understanding the current career training choices made by Neurology trainees and the trends which these choices are following will be important for addressing the shortfalls predicted in the number of clinical neurologists in the USA. [13,14] The changes occurring in neurology residents and fellows over the past decade have been gradual and unique to each subspecialty. In addition to the well-established subspecialties there are residents seeking additional training in less codified, but still important fields such as therapeutic development. Viewed broadly, there is an evident steady increase in the number of Neurology susbspecialty training programs and fellows. When looked at on a subspecialty by subspecialty basis the trends become more complicated. Some subspecialties such as Endovascular Surgical Neuroradiology have a limited number of accredited programs and fellows that interpretation of trends is not feasible. The situation for Endovascular Surgical Neuroradiology is particularly complicated as there are multiple training paths which can be followed to reach this endpoint and there are a number of subspecialists, often situated in separate departments, including neurology, neurosurgery, and neuroradiology who care for these patients and have overlapping skill sets. The effects of the training background on patient outcomes have not been thoroughly studied. Other recently accredited subspecialties such as Neurovascular and Clinical Neuromuscular have demonstrated robust growth rates since inception (650% per year and 344.4% per year, respectively). Other subspecialties, such as Neurodevelopmental have shown little growth in the number of training programs (growth rate of 75% per year) and a steady number of new fellows. These trends are most likely substantially affected by real or perceived work-force demand, as has been previously implied for some subspecialties. [16,17] Other factors which likely influence career choice in neurologic subspecialties include, but are not limited to, lifestyle factors such as salary, work hours, and duration and rigor of training as well as the factors which can influence success in an academic career. Our study does not address the underlying factors which influence these trends, but merely describes them. This knowledge helps facilitate strategic planning on how to best assist supply meeting demand. While the details of how to do so are beyond the scope of this study, they can include various incentives to increased recruitment in subspecialties facing deficits in clinicians. There is no patient data involved. There is no ethics issue in this paper. 1. Hodgson TS, Brorson JR, Ardelt AA, Lukas RV. Accrediting neurology fellowships accelerates subspecialization. Front Neurol 2013;4:94. 2. Kline JP. The academic neurohospitalist: building a successful career and practice. Ann Neurol 2015;78:515-9. 3. Shih LC, Tarsy D, Okum MS. The current state and needs of north american movement disorders fellowship programs. Parkinsons Dis 2013;2013:701426. 4. Johnson NE, Maas MB, Coleman M, Jozefowicz R, Engstrom J. Education research: neurology training reassessed. The 2011 American Academy of Neurology Resident Survey results. Neurology 2012;79:1831-4. 5. Teixeira-Poit SM, Halpern MT, Kane HL, Frost HC, Keating M, Olmsted M. Factors associated with interest in subspecialty training among neurology residents. Teach Learn Med 2015;27:138-46. 6. Jordan JT, Mayans D, Schneider L, Adams N, Khawaja AM, Engstrom J. Education research: neurology resident education: trending skills, confidence, and professional preparation. Neurology 2016;86:e112-7. 7. Gilbert DL, Horn PS, Kang PB, Mintz M, Joshi SM, Ruch-Ross H, Bale JF Jr. Child neurology recruitment and training: views of residents and child neurologoists from the 2015 AAP/CNS Workforce survey. Pediatr Neurol 2017;66:89-95. 8. Robbins MS, Haut SR, Lipton RB, Milstein MJ, Ocava LC, Ballaban-Gil K, Moshé SL, Mehler MF. A dedicated scholarly research program in an adult and pediatric residency program. Neurology 2017;88:1366-70. 9. Bega D, Krainc D. Challenges to neurology residency education in today's healthcare environment. Ann Neurol 2016;80:315-20. 10. 2013-2014 Annual Report - ACGME. ACGME Data Resource Book. Available from: https://www.acgme.org/acgmeweb/Portals/0/PDFs/2015%20AEC/2013-14ACGME_AnnRep.pdf/. [Last accessed on April 7, 2017]. 11. United Council for Neurologic Subspecialties. Fellowships. Available from: https://www.ucns.org/apps/directory/. [Last accessed on April 18, 2017]. 12. Careers in Medicine. AAMC Website. Available from: https://www.aamc.org/cim/. [Last accessed on April 18, 2017]. 13. Dall TM, Storm MV, Chakrabarti R, Drogan O, Keran CM, Donofrio PD, Henderson VW, Kaminski HJ, Stevens JC, Vidic TR. Supply and demand analysis of the current and future US neurology workforce. Neurology 2013;81:470-8. 14. Hodgson TS, Lukas RV. The Workforce Task Force Report: clinical implications for neurology. Neurology 2014;82:818. 15. Taylor LP, Lukas RV, Safdieh JE, Sigsbee B. Subspecialization in neurology: the role of the United Council for Neurologic Subspecialties. Neurology 2012;78:514-5. 16. Guptill JT, Dupuis RE, D'Cruz O. Emerging subspecialties in neurology: clinical development. Neurology 2013;80:e4-7. 17. Adams HP Jr, Biller J. Future of subspecialty training in vascular neurology. Stroke 2014;45:3730-3. 18. Rizzoli P, Weizenbaum E, Loder T, Friedman D, Loder E. The evolution and geographic distribution of headache medicine fellowship programs and graduates: an observational study. Headache 2014;54:1591-600.